Disney’s highly acclaimed a cappella group, DCappella, have announced Friday, November 16th as the official release date for their forthcoming self-titled debut album, which will be available at all digital and physical retailers. Following the release will be the group’s first ever North American tour, which includes a stop at the F.M. Kirby Center on Wednesday, February 13 at 7:00 p.m. 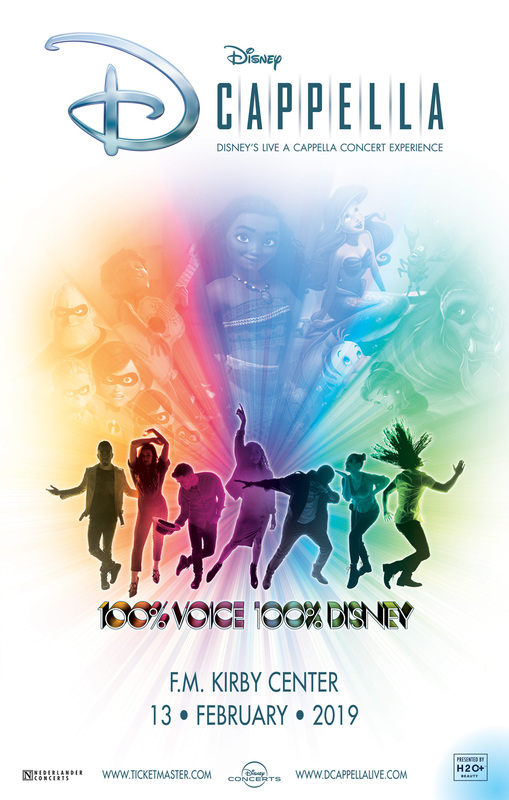 The tour features a contemporary production of new Deke Sharon arrangements of Disney classic and modern hits, bringing to life a truly unique a cappella experience. Skincare company, H2O+ Beauty is the co-sponsor of the national tour. Tickets for DCappella’s 2019 North American tour will go on-sale to the general public beginning Friday, October 19 at 10:00 a.m. Ticket are available online at kirbycenter.org, at the Sundance Vacations Box Office at the F.M. Kirby Center and charge by phone at 570-826-1100.